Celebrate your Feline Family on National Cat Day! National Cat Day is celebrated every year on October 29th. It was founded in 2005 by Colleen Paige, a Celebrity Pet and Family Lifestyle Expert and author. The National Cat Day website states that it was created "to help galvanize the public to recognize the number of cats that need to be rescued each year and also to encourage cat lovers to celebrate the cat(s) in their life for the unconditional love and companionship they bestow upon us." The day is supported by the American SPCA. Here are a few ideas to honor and show love to your cat(s) on their special feline-friendly day. 1. 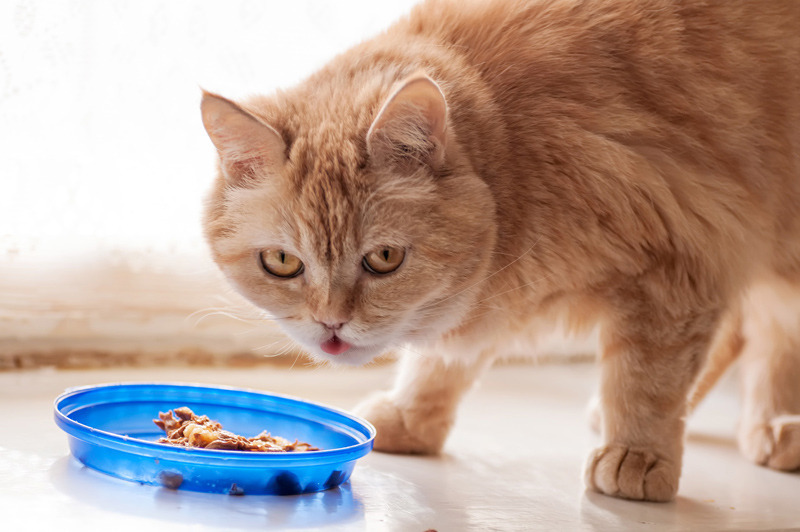 Feed your cat pure, nutritious food with no corn, wheat, soy or by-products. Canned food will help hydrate your cat. Dry food doesn't contribute any moisture to your cat's body and is more calorically dense than dry food. Remember: Optimal health and behavior depend on optimal feeding! 2. Engage your cat(s) in some fun "hunting" activities with a few new cat toys which meet the need of their "inner hunter". Dusk and dawn are the best times for this fun activity. Use interactive cat toys for this&mdash;DaBird, the Cat Catcher and peacock feathers are excellent examples. Safe, independent play toys are also necessary. Dog owners walk their dogs every day and cat owners need to "hunt" with their cat(s) every day! Cats are hard-wired for hunting because their survival has depended on it for centuries. Daily "hunting" activities often help to reduce some feline aggression problems. 3. Provide environmental enrichment for your indoor cat(s). Our feline buddies are really "little big cats" and have a need for stimulation on a daily basis. Birds fly, fish swim and cats are hard-wired to climb. If you don't have one, consider adding a tall (5' or 6' tall, sturdy cat tree and place it in a location where you spend time (your cat wants to hang out near you!). A sturdy 36" or taller scratching post, numerous places to hide, window perches, pet music and lots of safe cat toys will make your home more cat-friendly and your cat happier. 4. If your cat(s) have not had a veterinarian check-up in the past year, please make an appointment as soon as possible. The best way to save on your vet bill is to make sure your cat is examined at least once a year. Cats age much faster than we do and their health condition can change quickly. Some "behavior problems" are due to undiagnosed physical problems. For example, dental disease occurs in 85% of cats (and dogs). However, since cats mask pain so well, you probably won't have any idea your cat is in pain without an exam and dental x-rays done by your veterinarian. 5. Please reach out to a Cat Behaviorist if you experience cat behavior problems. You may feel you have tried everything, but an experienced Cat Behaviorist will recommend a customized treatment plan with ideas you probably have not considered. 6. Volunteer and/or donate to your local animal shelter. Do whatever you can to support their tireless work with our furry family members! Of course, EVERY day is National Cat Day on your cat's calendar!